Female macroptera. 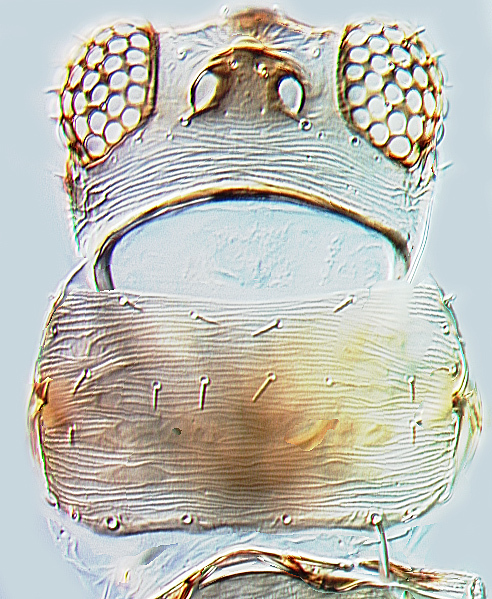 Body yellow, ocellar region brown, also anterior margin of mesonotum and median area of tergites II–VIII; IX–X dark brown; antecostal ridges on tergites III–VIII dark across full width of segments, on sternites III–VII shaded full width of segments; fore wings weakly shaded; antennal segment I pale, II brown, III–VIII light brown. Antennae 8-segmented. Head with vertex striae closely spaced and transversely anastomosing; ocellar region lacking obvious sculpture; ocellar setae pair III close together, distance between their bases less than four times the diameter of the basal pores, arising almost on tangent joining anterior margins of posterior ocelli; two pairs of post-ocular setae. Pronotum with transverse striae regular and closely spaced; posteromarginal setae S2 about twice the length of S1, S3 shorter than S1. Metanotal reticulation equiangular anteriorly, longitudinally reticulate on posterior half, median setae behind margin. Fore wing clavus with 3–4 marginal setae; first vein setae 3+2–4+1+1+0-1+0-1; second vein 1–2 setae; basal posteromarginal fringe cilia straight. 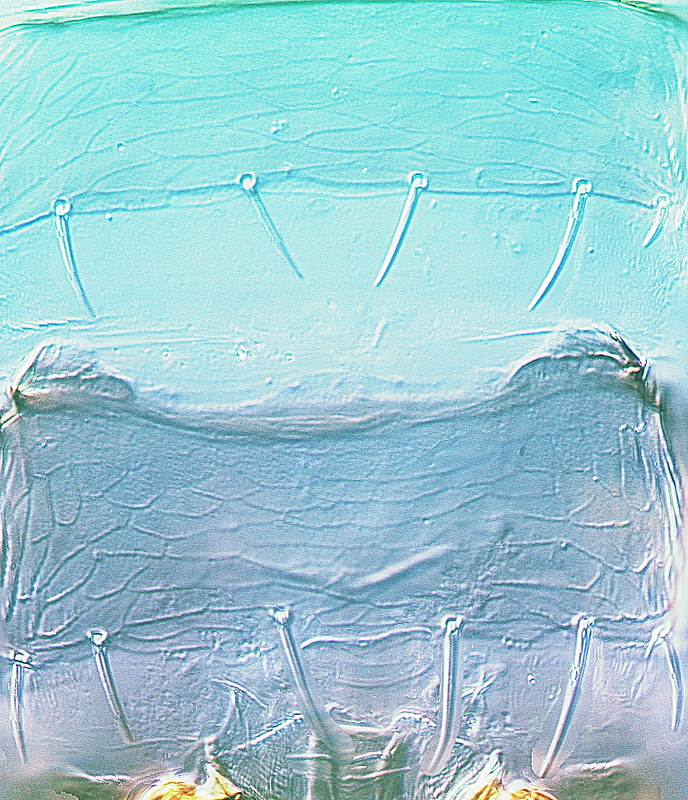 Tergite I without setae, tergites III–V median setae short, distance between bases less than two times the length of these setae; tergal microtrichial fields with 3 discal setae; VIII–IX without discal microtrichia medially, posteromarginal comb on VIII complete; tergite IX with paired minor posteromarginal setae between S1 and S2 equally as stout as these setae. 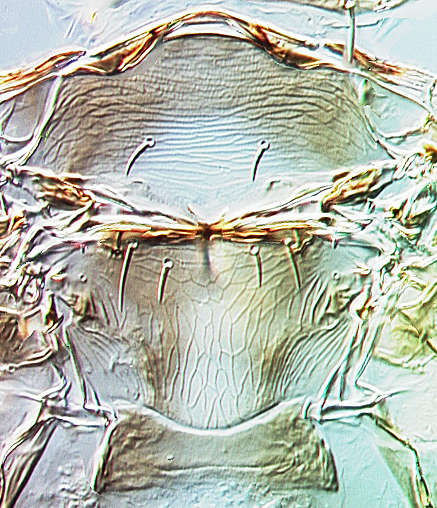 Sternites III–VI with 3 pairs of posteromarginal setae; microtrichial fields if present, scarcely extending mesad of S3. Male macroptera. Body pale; sculpture similar to female; tergite IX with pair of rather short, pale drepanae; aedeagus without stout spines. The genus Scirtothrips comprises over 100 described species worldwide, with 21 species known from Australia most of which are endemics to this continent. These species all have the lateral thirds of the abdominal tergites covered in closely spaced rows of fine microtrichia, and in many species the sternites also bear similar microtrichia. 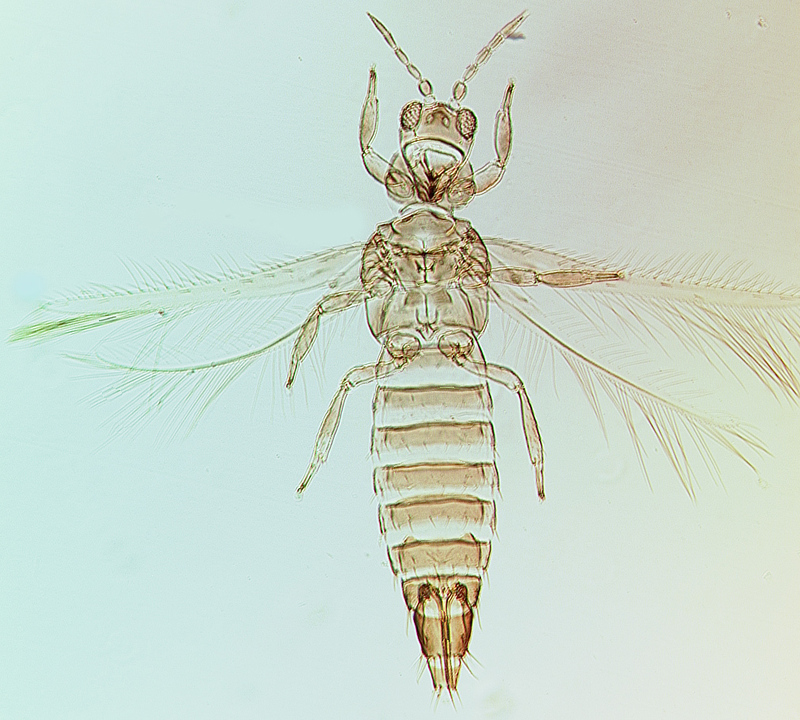 The antennae are 8-segmented, except in S. casuarinae and S. solus, both forewing veins have an irregular and incomplete setal row, and a median spinula is present on both the meso and metafurca. S. akakia is a member of a species-group found on Acacia. Together with S. kirrhos, S. moneres and S. quadriseta, it lacks ocellar region sculpturing, the first abdominal tergite lacks setae, and females have dark markings particularly inside the ocellar triangle and on abdominal segments IX and X.
Scirtothrips akakia Hoddle & Mound, 2003: 10.